Student Organization for Sustainability (SOS) is a great way for students get more involved in campus efforts. "The purpose of SOS is to promote awareness of environmental issues ranging from the local to the global scale and to take actions that might alleviate unsustainable activities. Besides promoting awareness and organizing activities, we will also strive to educate and instruct the campus and greater community about what can be done to solve environmental problems. Additionally, we will promote the sustainability of natural resources through appropriate means that affect and/or are affected by the campus, surrounding community, and global community." 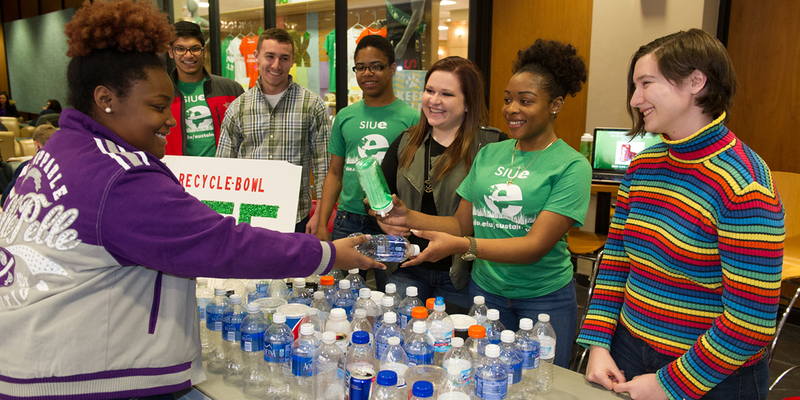 Association for the Advancement of Sustainability in Higher Education (AASHE) is an association of colleges and universities that are working to create a sustainable future (SIUE joined in September 2008). Their mission is to empower higher education to lead the sustainability transformation by providing resources, professional development, and a network of support to enable institutions of higher education to model and advance sustainability in everything they do, from governance and operations to education and research. AASHE defines sustainability in an inclusive way, encompassing human and ecological health, social justice, secure livelihoods, and a better world for all generations. SIUE is an Institution member. From their website you can create a new account for yourself using your SIUE email address and following the instructions. The US Green Building Council (USGBC) is a Washington, D.C.-based 501(c)(3) nonprofit organization committed to a prosperous and sustainable future for our nation through cost-efficient and energy-saving green buildings. USGBC works toward its mission of market transformation through its LEED green building certification program, educational offerings, a nationwide network of chapters and affiliates, the annual Greenbuild International Conference & Expo, and advocacy in support of public policy that encourages and enables green buildings and communities. The American College Personal Association (ACPA) is headquartered at the National Center for Higher Education in Washington, DC, is the leading comprehensive student affairs association that advances student affairs and engages students for a lifetime of learning and discovery. The National Association of College and University Business Officers (NACUBO) is a membership organization representing more than 2,500 colleges, universities, and higher education service providers across the country and around the world. NACUBO sponsors an annual Smart and Sustainable Campus conference.